Christine Street invokes the sentiment of finding the strength to move forward with her meditative bracelet. When we're faced with life's challenges, it can take all of us to find the courage inside to trust fate's plan for us, regardless of the outcome.Christine Street invokes the sentiment of putting our doubts aside and finding the strength to move forward with her meditative bracelet. 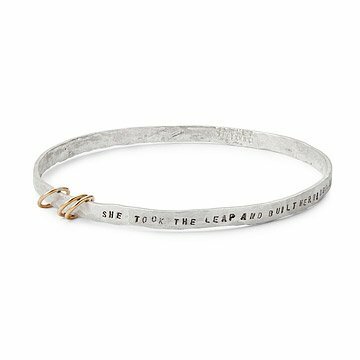 Embellished with the quote "She took the leap and built her wings on the way down," her reclaimed silver bangle provides a powerful reminder that you can grow stronger and wiser as you chase even your wildest dreams. Three delicate 14 karat gold-filled rings float around the band, providing subtle contrast and a counterpoint to the rough-hewn silver. Handmade in Los Angeles, California. Clean with mixture of warm water (1 cup), baking soda (1tbl) and salt (1tbl). Wipe with cloth after soaking for 20 minutes. For my niece's 18th birthday. So appropriate. So delicate. So meaningful. So unique. And so beautifully made. The bracelet is pretty, but very thin and bends very easily and loses its shape. For the price I think it's too thin. Meaningful graduation gift that was tremendously well received, worn immediately with great joy.